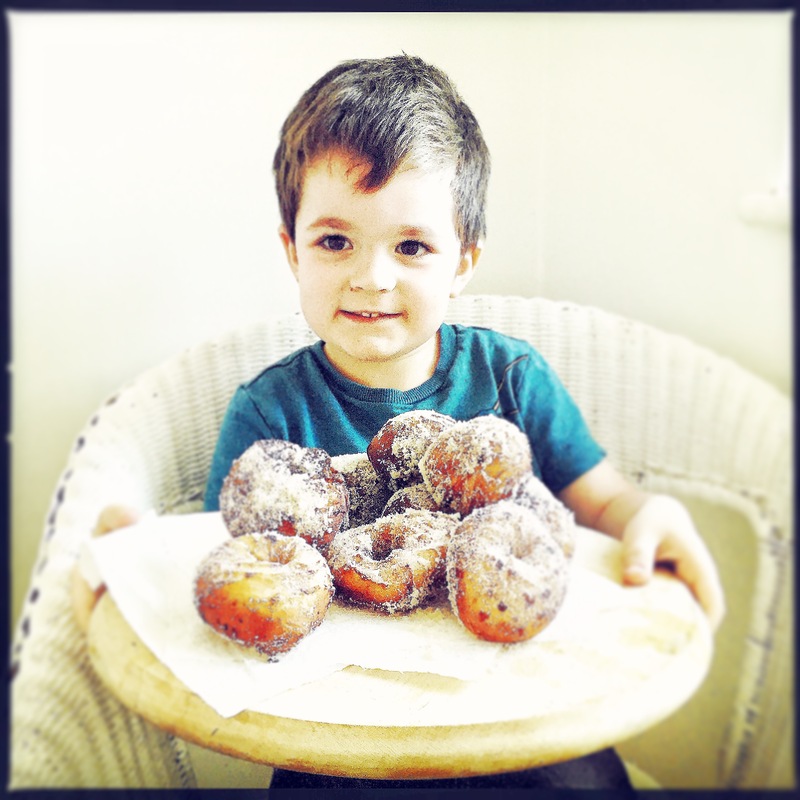 The first time I had fresh doughnuts straight from the fryer was a revelation. There was a small stall between Covent Garden tube station and the market, basically a fryer on wheels. When some friends and I used to come up to London for whatever reason and found ourselves there, we would stuff our faces. They were hot and soft, sugary and delicious and felt like such a treat. Completely unlike the stodgy, cold shop-bought ones. Now, whenever possible I make my own. Cooking with the children is always good fun and baking is a really easy way to involve them. Rather than starting off with complicated savoury dishes, things like biscuits, cakes and doughnuts are great hands on recipes. 1. Warm the milk and add the yeast and a pinch of sugar. Leave to stand for about ten minutes until slightly foamy. 3. Knead for about five minutes then cover the bowl and leave to rise for about an hour, or until doubled in size. 4. Knead again for a couple of minutes then on a floured surface shape into balls and doughnuts and leave to rise for another twenty minutes or so. 5. Heat the oil to 175c in a deep pan or preferably a deep-fat fryer and gently cook the doughnuts in small batches for a couple of minutes or so on each side. Don’t let the oil get too hot or they will remain uncooked on the inside and burn on the outside. 6. Drain on kitchen paper and roll in sugar. When cool enough to handle, fill the centre of the balls using a pipette with your choice of filling. I think you can’t beat raspberry jam, but you could also use caramel or Nutella or whatever you fancy. I also like to drizzle them with caramel or melted chocolate and chopped hazlenuts. Looks like one happy kid! I can imagine these home fryed doughnuts are a piece of heaven for sweet toothed persons like me!